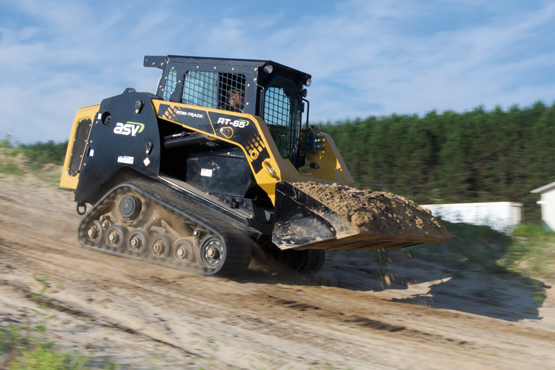 ASV Holdings Inc. introduces the new radial-lift RT-65 Posi-Track® compact track loader. The CTL is ideal for digging and ground engagement work in construction, excavation, landscaping, snow-clearing and rental applications. The new RT-65 was shown at the ARA Show 2019 in Anaheim, California. The RT-65 boasts industry-leading serviceability so operators can spend less time maintaining the machine and more time on the job. These features include a swing-out radiator, top hood and side doors that allow access to all sides of the engine compartment, including filters and other daily checkpoints. The unit’s cooler swings out with the door, giving operators total access for easy cleaning and improved machine performance due to the cleaner cooler. The RT-65 comes with a turbocharged 67-hp Deutz 2.2 l T4f diesel engine that requires no regeneration, exhaust sensors or diesel exhaust fluid. The RT-65 features a rated operating capacity of 873 kg and a tipping load of 2,495 kg. It is 168 cm wide and has a 296 cm lift height. Standard joystick controls make operation easy and intuitive, while a self-leveling system allows attachments to stay at a set position while lifting. Operators can use the unit with all standard attachments.